Thank you for your interest in becoming a vendor at the Pittsburgh Vintage Grand Prix. With over 250,000 total spectators, the Grand Prix is an excellent Western PA event to showcase your products and services. It is an excellent opportunity to reach the buying public and to market to motorsport enthusiasts. Founded in 1983 the Pittsburgh Vintage Grand Prix has grown to become the country’s largest vintage race event run on city streets. The PVGP is a charity event. Funds raised are donated to help individuals in the Pittsburgh region with autism and intellectual/developmental disabilities. Within our Race Week we offer three distinct events where vendors can be a part of the nation’s largest vintage race event. Don Privett manages all of our Vendor Village locations. Please call or email Don Privett at 412-390-4712 to determine availability before registering and paying. Vendor Village at Schenley Park has been transformed with uniformed tents and a dedicated vendor pathway. Each vendor spot now includes a PVGP supplied white hi-peak tent with a backwall. Three sizes of tents (10×10, 15×15 and 16×26) are available. This greatly improves the appearance and set-up of the tents – increasing traffic flow and business through the entire Vendor Village area. Tables, chairs, tent sidewalls and electricity are available for rent and will be in your tent when you arrive. 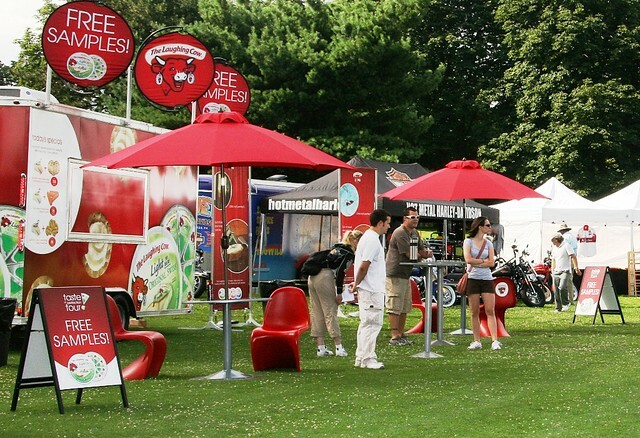 This is a dedicated area within Schenley Park that provides an excellent opportunity for you to display and sell your products and services to over 200,000 weekend spectators. Vendor set-up is from noon – 7:00 PM on Friday July 19. You will need special permission if you must move-in on Saturday and hours are limited from 8:00 AM – 9:00 AM. Vendors must be moved out by 7:00 PM Sunday. Sales should begin by 10 AM and close at 5:00 PM each day. This village is built on a golf course so your display cannot involve RV’s, heavy trucks heavy, handling equipment or building materials. Please call Don Privett at (412) 390-4712 to discuss if your display involves more than a tent, table and chairs. The backwall will provide you with an area behind your tent to park one support vehicle. If you have a second vehicle or a vehicle longer than 15 feet you will not be able to park them behind your tent and you will need to purchase adequate space alongside. If you have your own tent, display or custom trailer that you feel you must use to vend please contact the Grand Prix to discuss an optional location. We offer a sponsorship package for organizations that want a vendor tent and are also interested in taking advantage of our advertising amenities. The cost is $3,500 and a tent is not included, but can be provided for $500 additional. We offer a special vendor package for automotive restoration shops at Schenley Park. It permits you to display up to three cars beside your tent. There are a limited amount of spaces in the paddock for vendors of racing related equipment and in the Cortile for Italian car vendors. Costs and times are the same. Please let us know if this is of interest to you on your application. Approaching it’s 16th year, the loud and exciting PVGP Historic Races provide another opportunity for you to exhibit during our Race Week. Spaces are a generous 15′ wide x 15′ deep and you can purchase adjacent spaces if needed. Each spot is $250 for the weekend. There is no discount on additional spaces. Vendor’s may set-up beginning on Saturday morning from 8:00 AM until 10:00 AM. Sales begin at 9:00 AM and close each day at 5:00 PM. The facility must be turned over Sunday night we ask that each vendor pack-up by 7:00 pm Sunday. While our race weekends attract tens of thousands of spectators, don’t forget about our Waterfront Car Cruise. Within a few short hours you will be exposed to an enthusiastic crowd of several thousand. The audience is composed of auto enthusiasts who bring their car, families out for the evening and shoppers from dozens of Waterfront stores and restaurants. Our Car Cruise at the Waterfront shopping center in Homestead is expecting 500-700 cars and is open to the public for free from 4:00-9:00 PM. The Grand Prix displays cars and vendors in the parking lot between First Commonwealth Bank and Steak n Shake. No power or tents are available – you will need to bring your own. Three parking spaces (approximately 18′ x 27′) are allocated and you can purchase additional spots as needed. You can set-up beginning at 2:00 PM. The cost is $200 for the entire evening with no quantity discounts.